To continue doing business in Germany after Hitler's ascent to power, Hollywood studios agreed not to make films that attacked the Nazis or condemned Germany's persecution of Jews. Ben Urwand reveals this bargain for the first time--a "collaboration" "(Zusammenarbeit)" that drew in a cast of characters ranging from notorious German political leaders such as Goebbels to Hollywood icons such as Louis B. Mayer. At the center of Urwand's story is Hitler himself, who was obsessed with movies and recognized their power to shape public opinion. In December 1930, his Party rioted against the Berlin screening of "All Quiet on the Western Front," which led to a chain of unfortunate events and decisions. Fearful of losing access to the German market, all of the Hollywood studios started making concessions to the German government, and when Hitler came to power in January 1933, the studios--many of which were headed by Jews--began dealing with his representatives directly. 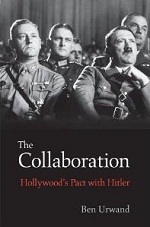 Urwand shows that the arrangement remained in place through the 1930s, as Hollywood studios met regularly with the German consul in Los Angeles and changed or canceled movies according to his wishes. Paramount and Fox invested profits made from the German market in German newsreels, while MGM financed the production of German armaments. Painstakingly marshaling previously unexamined archival evidence, "The Collaboration" raises the curtain on a hidden episode in Hollywood--and American--history.